Available only at The Container Store, our Ventilated Shelf Bracket Accessories add great functionality to any Elfa solution. Made from epoxy bonded steel, they provide visible and accessible storage for all sorts of accessories and garments. Use the Hooks for belts, ties, scarves, necklaces, sashes, caps, handbags, totes, robes, jackets, and coats. The Trays are ideal when storage is needed for jewelry, wallets, cell phones, change or other items. White Elfa Ventilated Wire Shelf Bracket Hooks is rated 5.0 out of 5 by 11. Rated 5 out of 5 by Lenna from Orderly and efficient! This 10-hook shelf bracket accessory might be my best elfa purchase yet. It got a couple dozen belts out of the big clumps draped over two hangers and into nicely arranged groups by color and width. Each hook easily holds three or four belts, and this new rack made it evident that the belts at the bottom of the clumps were those I've not been using and don't need to keep! Streamlining the stuff in my closet is one of my favorite results of elfa organization. Rated 5 out of 5 by JNHK from 10-Hook Bracket This 10-hook bracket is perfect for holding my collection of belts. I mainly have skinny belts, and these hooks are just the right size for them. I like that I can fit multiple belts on a single hook. 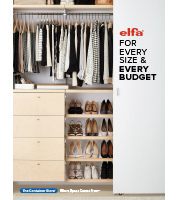 I just wish that the bracket came with the walnut fascia to match my elfa closet. Rated 5 out of 5 by jopritch from Useful Hooks I bought the five-hook bracket accessory to add to our previously installed Elfa closet that we've had for 2 years. I realized there were things like robes that I'd worn once but didn't need laundering quite yet, and I wanted a place to store them between wears. Perfect solution. Rated 5 out of 5 by HazelEyz from Fab Hooks These hooks attached effortlessly to the side of a shelf and I was able to use the space immediatey. I have one for belts and one for long and bulky necklaces that don't fit easily into my jewelry drawer. I would definitely reccommend these hooks for your elfa closet system. Rated 5 out of 5 by Mamacabeza from Finally--exactly what we needed! I've been waiting for something like this for my husband's and son's closets--the perfect way to store belts. Simple to install, and problem solved! Rated 5 out of 5 by ChipStone from Neatest thing EVER! Bought the five hook bracket to hang the PJ's and robes on. So neat and clean and left a little wall space for something else. What a cool idea! Everyone should have one! Rated 5 out of 5 by reebs75 from Doubles as a necklace holder! I've many necklaces and no place to hang them. When we installed our closets, we got 2 of these for belts and ties. I went and bought 2 more and use them to hold my necklaces as well. Genoius! Can this be used in a utility room to hang an ironing board? We're using these hooks for clothes which aren't as heavy as an ironing board. My impression is this piece is strong enough to hold the weight of an ironing board but I have no idea how you'd get it to stay. The 12&quot; elfa Bracket 4-Hook and 16&quot; elfa Bracket 5-Hook have hooks that each measure 5/8&quot; wide. The 12&quot; elfa Bracket 8-Hook and 16&quot; elfa Bracket 10-Hook have hooks that each measure 5/16&quot; wide. Is this shelving (and the brackets) food safe? Storing food directly Our Elfa Ventilated Wire Shelves, Ventilated Wire Shelf Brackets, and Hooks is not recommended. can this be used on a bracket mid shelf? can this be used on a bracket that has a wire shelf on top of it in the middle of a long shelf? No, our elfa Ventilated Wire Shelf Bracket Hooks can only be used on the open end of an elfa Ventilated Wire Shelf Bracket. For hooks at any point along an elfa Ventilated Wire Shelf, we offer our elfa Shelf Hooks (links provided below). What is the depth of each hook (e.g. how far does it stick out from the shelf bracket)? The hooks of our 12&quot; Elfa Bracket Hook-8 and our 16&quot; Elfa Hook-10 are 1-1/8&quot; deep. The hooks of our 12&quot; Elfa Bracket Hook-4 and our 16&quot; Elfa Bracket Hook-5 are 1-5/8&quot; deep. What is the dimension (width) of each hooks? The hook on 10 hooks one seems narrower than the 5 hook one. Could the 16 inch 5 hook version support the weight of 5 umbrellas? Not sure if that&rsquo;s too much weight concentrated on the end of the bracket. Can they be used on 20&quot; brackets? Can the 16&quot; version be used on 20&quot; brackets instead of 16&quot; brackets? For best results, our 16&quot; elfa Ventilated Wire Shelf Bracket Hooks are only recommended for use with our 16&quot; Ventilated Shelf Brackets.